If the first images in your mind of the words “vinyl tile” include 1950’s kitchens, school hallways, or cheap linoleum, then you haven’t seen how the product has evolved in recent years. In previous decades, the term “luxury vinyl tile” would have sounded like an oxymoron. Today, luxury vinyl tile is the fastest-growing floor product on the market. 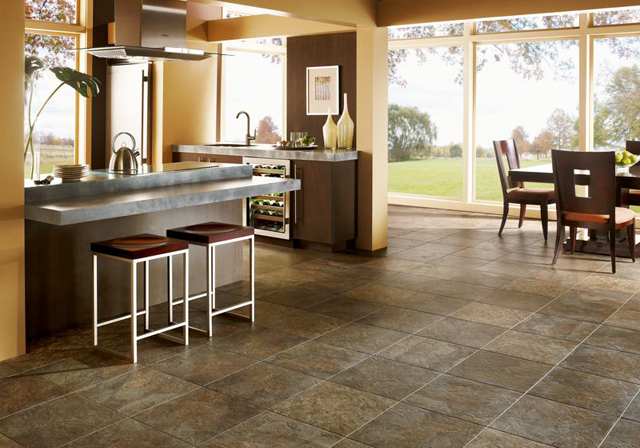 Sales of luxury vinyl tile reached $500 million in 2013, a 13 percent increase from the previous year. Sales in 2014 are expected to grow even more, making luxury vinyl tile (or “LVT”) the most popular flooring material in America. LVT is much easier to install than ceramic tile or hardwood floors. You can install LVT yourself, either with adhesive or without. You can lock the tiles together and set them on a special “underlayment” to keep them in place. If you choose to use a professional installer, the installation time and costs are also much less than with ceramic or hardwood floors. The professional installers at Direct Source Flooring can give you side-by-side comparative estimates to show you the difference LVT can make. A major drawback of previous types of vinyl flooring was its tendency to retain scratch and scuff marks. Today’s LVT uses modern materials that resist scratches, scuffs and stains. LVT also stands up to heavy traffic from adults, children and pets. Even under the heaviest foot traffic, LVT resists chipping and cracking, while maintaining its original look and feel for years. LVT is also waterproof, making it a perfect solution for kitchens or other high traffic areas where moisture is a concern. Since LVT comes in a wide range of colors, styles and textures, you can choose the look and feel you want from your floor, at a fraction of the cost. LVT products come in wood, tile, and stone designs, which gives you the chance to create the look that matches your tastes and budget. If you have not-so-fond memories of buffing out scuffs and scratches from vinyl tile by hand, those days are over. Simple maintenance tasks like sweeping, mopping, and dusting can remove the dirt and grit that can scratch the LVT surface. LVT also keeps its looks and luster much longer than traditional tile or vinyl, so you can enjoy the looks of your new floor for years to come. The experts at Direct Source Flooring can show you all the benefits of LVT. Our friendly staff has decades of experience with LVT and other types of flooring products. Our showroom also has the latest designs that can fit your style and budget. Get started by filling out the form to the right and set an appointment to see us today!